My dad started getting me interested in cars early, beginning with buying me Matchbox cars as a child. He loved that I was picking out cars on the highway at night by headlight and taillight arrangements. We built a model of his baby blue '62 Corvette when I was around 8. We went to car shows off and on, but that sort of tailed off when I was around 10. I don't think he realized how interested in cars I'd become until, at age 16 (1991), we started doing more car-oriented stuff again and I started relating stuff I'd learned on my own. We started going to more distant car shows, and then he found out about the Mid-Ohio SVRA Vintage Grand Prix. We planned to go on a Saturday for practices and qualifying races. When we arrived, I was suddenly in a whole new world...these were cars I'd only seen in magazines, and suddenly I could see, hear, and smell them with my own eyes (edit: and ears, and nose....shut up). Suddenly he was the one saying, "What is that?" and I'd reply, "THAT'S A FERRARI F40 SITTING NEXT TO A FORD GT40!" As a side note, I should say that most of these pictures were taken by me, but some were taken by him. Besides cars, he was very interested in photography. He used this trip to attempt to teach me how to use his 1978-vintage Canon AE-1 35mm camera. I wasn't so comfortable with using it, however, and took a lot of the still close-up shots with a Kodak Ektralite. On many of the action shots, I feel comfortable saying that he took them, but a few I know I took just because I was excited to see them turn out so well (including the one directly below). Dad loved his starlight filter. It worked out particularly nicely, on this Corvette. Below is the man himself, age 48. Sadly, he passed away in 1992. 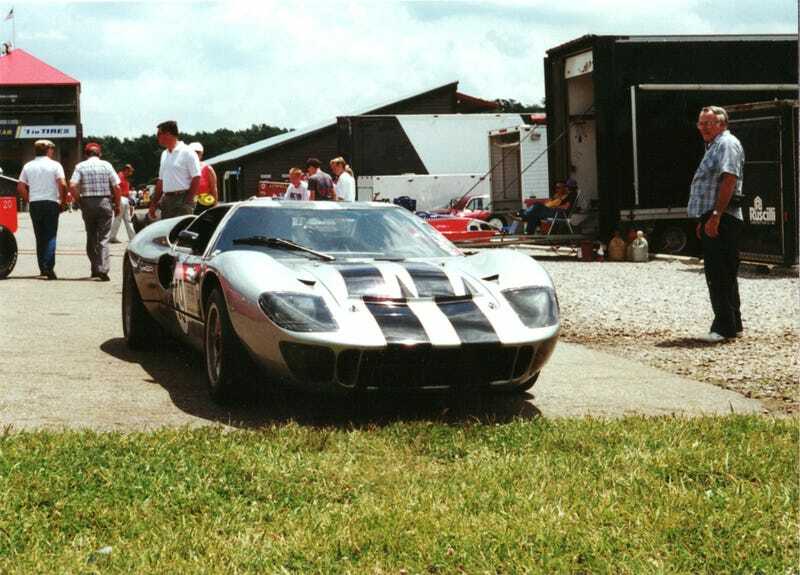 We managed to get one more trip to Mid-Ohio in 1992 as well as a few car shows. The day before he passed, we put new tires on my rusted-to-hell 1981 Accord coupe. More pics to come, as I get them scanned. I literally came home with a brick of old pictures when I last visited my mom.